Ride in the wild forest on the same trails used by The Conquistadors 400 years ago, swim in the river, play in the waterfall or the rapids. Enjoy an outdoor candlelit dinner and listen to the tales and anecdotes around the campfire with your choice of beverage. 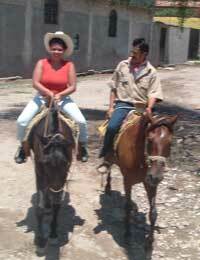 Hosted by owners Dr. Octavio Gonzalez and wife Mari. We can arrange private tours any day except Sunday. Departs From: Rancho El Ojo de Agua in Puerto Vallarta. Kids: 6 Years and Older. Kids same price as adults. OUR ADVICE: We look forward to doing this one soon. The owners are such nice people, and speak excellent English. A real Cowboy experience!